According to Epicurious, the fool originated in England in the fifteenth or sixteenth century. It is a simple dessert that combines tart fruit with whipped cream with more modern versions containing the addition of yogurt. The British traditionally made this dessert with gooseberries, but in spring rhubarb is the perfect choice, with its bright, tart flavor. 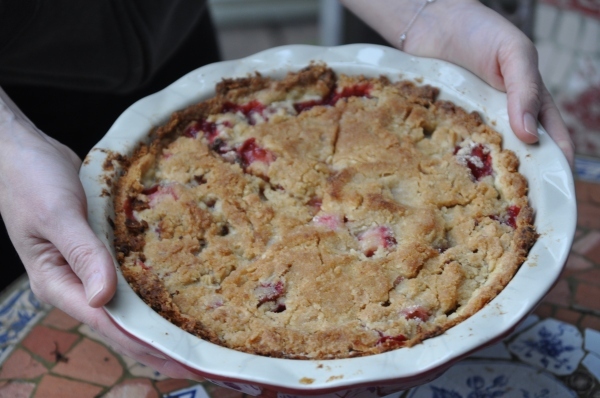 With the first burst of rhubarb, my go to recipe is always a sweet-tart strawberry rhubarb crisp. It’s a family favorite and our celebration of warmer temperatures and more treats to come. This week our Share of rhubarb comes without strawberries. No worries, there are innumerable ways to enjoy this tart veggie including the recipes below. Or, if you want to save your rhubarb for an extended period read the Rhubarb Central blog for tips on storing to keep it fresh and crisp.Extra bonus? Rhubarb Central has loads of additional rhubarb recipes to try! All too often Rhubarb ends up on the dessert table, especially when delivered with fresh strawberries! Not at Facebook group member Michelle Pasquaretta’s house this past week. 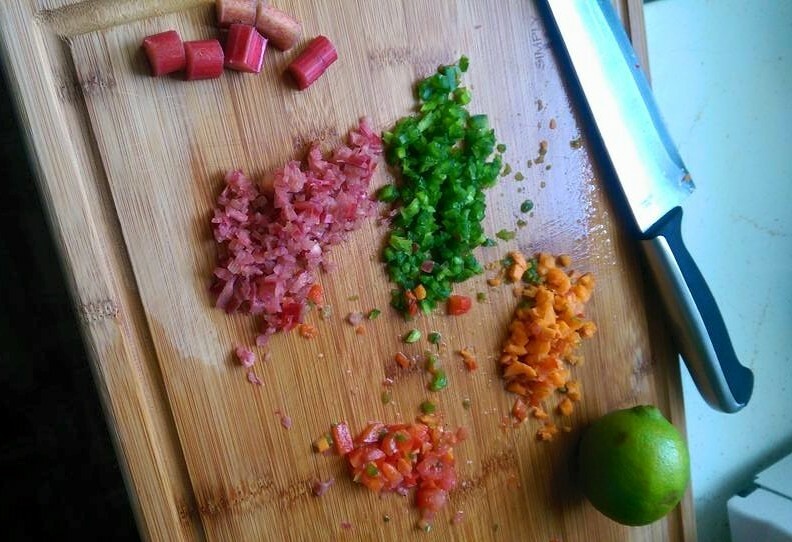 She shared her lovely photos and recipe for a zesty Rhubarb Salsa, a little something different, in case you’ve had too much crisp! One of our first local fruits of the season? Rhubarb! And it’s not just for dessert. Thanks, new Melrose member Julie Lanza for sharing this recipe! The last time we had rhubarb, Michael asked, “Are you gonna make a pie?” I thought I might, at the time but then it was so hot, and I was baking other things, and then ….I turned it into a smoothie. Which for the record was very, very good. Another CSA trip and we ended up with 1 pint of strawberries and 1 pound of rhubarb. And pie, it was. Several times last night, Michael declared this “the best pie you ever made”. I think it’s as good as the french silk pie I made over the winter, which was so dangerous to have around (even I, the queen of self-control was about to eat all of it myself) that I sent Michael off to work with it the next day. It’s good to share calories with other people. Espescially boys with fast metabolism. This one I’m keeping for us. Dangerous pie be damned. I was looking on Foodgawker for a recipe I wanted to use, and I came across this, and adapted slightly. First, make the pie crust. (And set the oven on 400 while you’re at it). 1 stick of butter, cut into small pieces. Place all ingredients into processor or stand mixer. (I went with stand mixer here because I couldn’t handle any more equipment on my counter!) Blend until the butter looks like tiny pea-sized sand bits. Smoosh dough together until it forms a ball (the butter will suddenly help it stick) and transfer to a bowl and put it in the fridge while you work on the rest. Mix filling together and let it rest while you make the topping. Finally, make the crumb topping. Combine everything and use a pastry cutter or place in a food processor or stand mixer. You want the butter to once again be cut into small pieces, with the mixture resembling wet sand. Take the dough out of the fridge and roll on a floured surface. You want to do this quickly as the butter starts to melt in a hot kitchen. Transfer dough to pie dish. 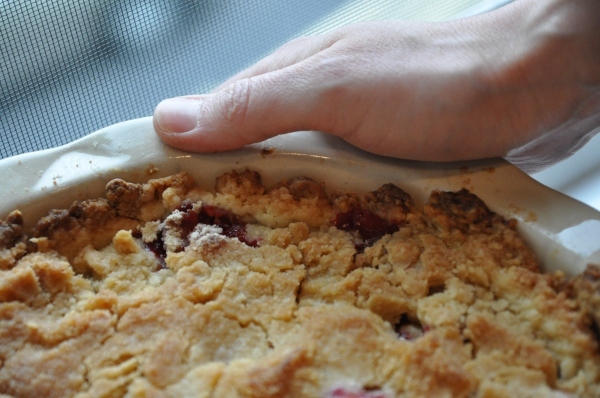 Fill with filling and top with crumb topping. Bake for about 50 minutes with a large baking sheet under the pie dish to catch any juice that might run over. I served this with fresh whipped cream (whipping cream, confectioner’s sugar). A little love note on this pie: one of the fastest I’ve ever make and best tasting too.